Home >> A Books >> Catch A New Batch of ABC Books! Catch A New Batch of ABC Books! ABC books are a great way to engage student interest in any topic. This week, Education World takes a look at a handful of the most recent books of the genre, including books about boats, the rain forest, and children with asthma. Editor's note: Looking for ideas for using ABC books across the grades and the curriculum? Check out this week's Education World LESSON PLANNING story, ABC Books Aren't for Babies, for more than 200 ideas for ABC books your students might create! The "King of ABC Books" is at it again! Author Jerry Pallotta's latest book, The Boat Alphabet Book (Charlesbridge Publishing), joins last year's The Airplane Alphabet Book and its predecessors, which include The Dinosaur Alphabet Book, The Icky Bug Alphabet Book, The Extinct Alphabet Book, The Ocean Alphabet Book, The Desert Alphabet Book, and ten others -- all of which belong on library shelves everywhere! "A is for Aircraft Carrier. This military ship is a floating airport. An Aircraft Carrier can carry more than on hundred aircraft... About 6,000 people work and live on the largest Aircraft Carriers. On board, you will find a church, movie theater, library, hospital, dental office, post office, and even a barbershop. Each day, the barbers give over 250 haircuts, the cooks bake 800 loaves of bread, the crew drinks 13,000 cans of soda, and the kitchen staff sometimes serves up to 10,000 hamburgers! There are almost 2,000 telephones on board and 30,000 lights. What would you do if the captain said, "It's your turn to shut off all the lights"? They're all in The Boat Alphabet Book! Travel with Pallotta on canoes in lakes, and kayaks in raging rivers. Learn about the first boats -- reed boats -- and also about Quaffas and Barkentines and Umiaks! Learn about a boat called a Junk -- "even when it is brand new"! Learn that Minesweepers are made of wood because many of the mines (floating bombs) might be detonated by the magnetism of steel. ("They don't even have steel nails!") Or, when you become rich and famous, sail your yacht to an ABC of islands -- from Aruba to Zanzibar. And, while you're cruising with Pallotta, learn some basic nautical terms too! In The Boat Alphabet Book, illustrator David Biedrzycki joins Pallotta for the second time (The Freshwater Alphabet Book, 1996). Biedryzcki's beautiful illustrations capture twenty-six boats in all their exquisite detail. His brilliant settings -- from the lake's peaceful stillness to the wrath of the high seas -- capture the many moods of water. The Boat Alphabet Book is a fine addition to Pallotta's pack of alpha-books -- and a great addition to any teacher's transportation curriculum! Don't miss this trip through boat history. Get on board with Jerry Pallotta! If all of the really great alphabet books teach while they entertain, then The ABC's of Asthma is one of the best! 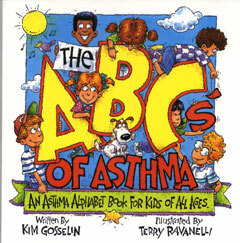 The ABC's of Asthma is written by Kim Gosselin, a mother on a mission! Gosselin, mother of a child with asthma and another with diabetes, broke ground a few years ago with two books intended to educate all children about these chronic problems. Gosselin had searched for nontechnical materials that she might share with her sons' teachers and classmates, but found nothing! So she authored the books Taking Asthma to School and Taking Diabetes to School. Since then, Gosselin's company -- JayJo Books -- has published a couple handfuls of educational titles, including Smoking Stinks, for which Gosselin recently received the President's Award of the National Lung Association. Now comes the newest title, The ABC's of Asthma. The book is written for children with asthma, but it's really a wonderful teaching tool for all children. Children who don't have asthma will learn some of the vocabulary associated with asthma -- and they'll develop an understanding of the condition and a healthy respect for those who have it. "B is for bronchial tubes. Bronchial tubes look a little like tiny, tiny tree branches. They carry air into my lungs." "D is for dust mites. Dust mites are itty-bitty bugs that live inside EVERYBODY'S home (no matter how CLEAN it is)! Dust mites can cause me to have an asthma episode (but they're too small to bite)!" "F is for Family. My whole family helps me to take better care of my asthma. We all work together!" Terry Ravanelli's illustrations of a multicultural, multi-age band of asthma kids make reading this ABC book an enjoyable learning experience, while driving home the idea that all kinds of kids have asthma. "In the age before steam engines and machines, workers toiled with their muscles to build America. This work might have consisted of raising sails, hauling up a ship's anchor, driving railroad spikes, or cutting down trees. Often the labor demanded rhythmical movement, and people would sing songs as they worked, not only to relieve their boredom, but also to make certain that everybody kept in time with one another...."
Each page of The Sailor's Alphabet illustrates a single line of a traditional alphabet chantey. "Oh, A is the anchor and that you all know, B is the bowsprit that's over the bow..." Each line is accompanied by one of McCurdy's splendid, hand-colored scratchboard drawings. The drawings capture the spirit of the chantey, and the toil of its singers. The result is a veritable piece of American history; an A-to-Z, stem-to-stern tour of a U.S. navy frigate of the 1830s. The word for each letter of the alphabet is simply defined under each illustration, providing a vocabulary lesson while teaching history. A teacher might read the chantey through once, so the rhythm of the song is clear, then return to read the definitions of unfamiliar terms. A final reread will bring new familiarity and understanding of the chantey's lyrics. The Sailor's Alphabet closes with an illustration of a full frigate, keyed to a list of terms introduced in the song. One more recent addition to the library of ABC books is worthy of note. 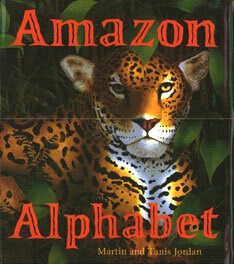 From illustrator Martin Jordan (text by Tanis Jordan) comes Amazon Alphabet (Kingfisher Books). The couple has journeyed into the Amazon rain forest many times, often for months without outside contact, to provide this respectful and affectionate tribute to one of the most unique of Earth's habitats. ...while Martin Jordan's illustrations capture life in the rain forest in all it dark mysteriousness and brilliant color. The personalities of twenty-six Amazon rain forest inhabitants are brought to life as only they could be by someone who has seen them up close. A pronunciation key for each unfamiliar creature appears at the bottom of the page. Supplementing the simple text and paintings is a glossary that provides a paragraph about each of the mammals, insects, reptiles, birds, amphibians, or fish. Those descriptions provide information about each animal's size, habitat, and habits. The Jordans have created a book to treasure, and a book to teach. It would make a fine addition to any collection of ABC books, or to any teacher's environment curriculum. 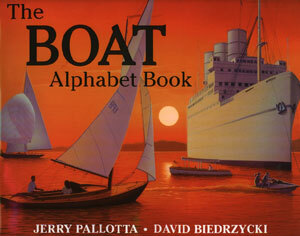 The Boat Alphabet Book, written by Jerry Pallotta and illustrated by David Beidrzycki, is published by Charlesbridge Publishing, 85 Main Street, Watertown, MA 02172-4411, phone (617) 926-0329. The ABC's of Asthma: An Asthma Alphabet Book for Kids of All Ages, is written by Kim Gosselin and illustrated by Terry Ravanelli. It's published by JayJo Books, P.O. Box 213, Valley Park, MO 63088-0213, phone (314) 861-1331 or (800) 801-0159. 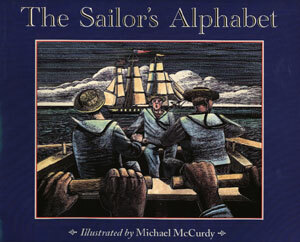 The Sailor's Alphabet, illustrated by Michael McCurdy, is published by Houghton Mifflin Company, 222 Berkeley Street, Boston, MA 02116-3764. Amazon Alphabet, illustrated by Martin Jordan, text by Tanis Jordan, is published by Kingfisher Books, an imprint of Larouse Kingfisher Chambers, Inc., 95 Madison Avenue, New York, NY 10016. Reading Activities for Read-In! Day!